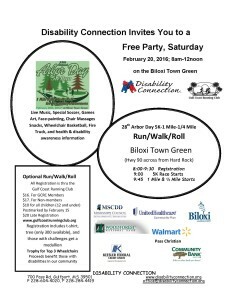 Come Join Us on February 20th, 2016 for our 28th Annual Arbor Day 5K-1 mile-1/4 Mile Run/Walk/Roll! The party is free and includes music, snacks, games, art and exhibitor tables with health and wellness resources. The Run/Walk/Roll is optional. All Registration is through the Gulf Coast Running Club. You can register at the event or pay a discount by pre-registering. Registration form is here. We hope to see you at the Biloxi Town Green between 8am-12pm on Saturday!